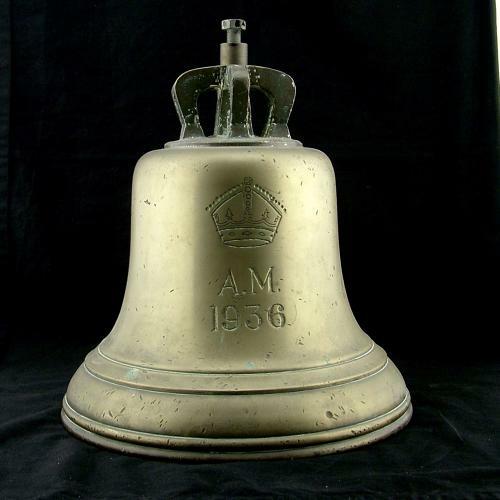 Large brass/bronze RAF station bell with classic 'crown' top. This is the larger of the two sizes produced, measuring approximately 32cm in height and 32cm diameter. It has the larger more elaborate Air Ministry markings, crown and 1936 date. This is the very first year of issue for these bells. Clapper absent. We have left the bell is in totally original condition. It has relatively minor 'dings', scratches and surface wear where it has been struck over the years and verdigris deposits inside - all commensurate with age. With some effort it could no doubt be polished to a shinier finish if desired but we prefer its original patina. Fitted with a threaded bolt and brass collar on the crown top - all removeable. Contrary to popular belief each station had more than one bell. They were not used exclusively to 'scramble' aircraft but due to various original 1940 Pathe newsreels these have become iconic symbols of the Battle of Britain and fighter pilots racing to their waiting aircraft. A must for every serious collector, these are increasingly difficult to find now. The rarest date to find and with large markings. A superb, impressive and imposing display piece. Extremely heavy at around 23kg unpacked - postage is given as a guide only and may require adjustment. As with everything we list this is guaranteed original and not one of the copies that are now surfacing. Stock code M23422.